Florida vs. Florida State. To hell with the Miami Hurricanes; THIS is the rivalry that determines the Sunshine State champion. Perhaps no other rivalry has seen the amount of shenanigans as this one. Among the highlights: a national championship rematch, a warmup pass fired at the head of the opposing coach, dancing on the opposing team’s logo at midfield after winning, full scale brawls directly stemming from the previous thing, and several instances of taking the other team’s dream or special moment and destroying it. Oh, and mockingly performing the other team’s sacred arm gestures (Florida’s Gator Chomp and FSU’s Tomahawk Chop) appear to be not only commonplace, but staples of the rivalry. But you can’t just take two teams located near each other and declare them rivals, like the SEC has done with Arkansas and Missouri and LSU and Texas A&M. It has to evolve over time. So how did Florida and FSU come to be such bitter enemies? Good question. I’ll sort of take responsibility here for Florida ducking FSU as an annual opponent throughout the infancy of the Seminoles’ program. In fact, I wish the Gators had played the Seminoles annually from 1947-1957; Florida would have more than likely whooped FSU on a yearly basis, and that “34-26” taunt Gator fans (myself included) love to use would represent a larger difference in those two numbers. If you haven’t figured it out by now, or are an FSU fan who needs a friendly reminder, 34-26 is the all time series score between Florida and FSU. And it favors Florida. So anyway: yes, Florida refused to play FSU, but FSU should be happy that Florida refused to play FSU because had Florida played FSU in the 1940’s and 1950’s, the Gators’ all time series lead would be even more lopsided than it already is… instead of using the fact that Florida refused to play FSU against Florida fans. The reality is, Florida gave FSU an eleven year head start before they began to pound on them. After all, what fun is hide and seek if you don’t turn your back and count to some predetermined number before chasing down your prey? Glad I got that out of my system. The beginning of the series was evidence of this theory. The Gators won five out of the first six, and tied the other one. FSU could only muster three whole touchdowns during this six year stretch, though they did fight Florida to an ugly 3-3 tie in 1961- a tie that Gator coach Ray Graves referred to as a “death in the family”. The Seminoles’ program was in its teenage years, so to speak, but the Gators had never really taken football seriously up until that point (as evidenced by using assistant basketball or baseball coaches to coach the football team for much of the first half century of its existence). So we both sucked, basically, but Florida was better than FSU. Now let’s move ahead to the good parts. FSU’s inferior facilities led Florida to refuse to play a game in Tallahassee in the baby stages of this rivalry. FSU then upgraded their stadium in 1964, so the Gators reluctantly trudged into the state capital to face the Seminoles for the first time on their home turf. But it was a booby trap. FSU QB Steve Tensi connected with Fred Biletnikoff for a touchdown to put the Seminoles up early, and they held on from there for a 16-7 win- their first ever over the Gators. That win punctuated FSU’s best season yet, as they went on to face- and defeat- Oklahoma in the Gator Bowl (a much bigger game then). So that stung, but the Gators merely returned to their winning ways the next year with a 30-17 win in Gainesville. Then it was back to Tallahassee in 1966. Florida came into the game ranked #10 in the country, while FSU was looking to play spoiler. And it looked like they had. Down 22-19 with 17 seconds left in the game, the Seminoles had the ball on the Florida 45 yard line. Quarterback Gary Pajcic lobbed a bomb to Lane Fenner, who looked like he caught the ball in the end zone for a game winning touchdown. But the Seminole celebration was halted when the referee signaled an incomplete pass; ensuing days’ photographs suggested otherwise. FSU failed to score on that drive and Florida survived. Then the Seminoles made a mistake in 1967. They went into Gainesville and beat Florida. All that did was awake a sleeping giant, and create a swirling torrent of misery and anguish for the Tribe. Sorry, FSU fans, but 20 years after your program was created doesn’t count as your infancy any more. The Gators ripped off nine straight wins over FSU from 1968-1976, which while uncommon for a rivalry, isn’t exactly unheard of (see Florida-Tennessee rivalry). But this period was particularly rough for the garnet and gold because of the manner in which they lost. Blowouts rained down upon the Seminoles; scores like 42-13, 49-0, and 34-8 became the new norm for Florida, and set the standard for decades to come. To repeat, Florida beat FSU 42-13 in Tallahassee in 1972; they must have decided that simply wasn’t good enough, and the following year, blew the Seminoles to kingdom come with a humiliating 49-0 win. And just to make sure there’s no misunderstanding, Florida beat FSU 49-0 in 1973. Never before has FSU beaten Florida by such a margin, nor have they really ever come close. That said, some of the wins were noteworthy for reasons other than the score. The 21-6 win in 1969 featured perhaps the single greatest defensive performance in Gator history. Or if you want to look at it the other way, FSU’s game notes and film from this day were probably either lit on fire or sunk in the Gulf of Mexico. FSU QB Bill Cappleman was sacked a ridiculous eleven times, FSU backs fumbled eight times and Florida was the recipient of five FSU turnovers. But the most incredible stat of all was FSU’s rushing total for the day. Take a guess as to what it was. I’ll tell you at the end of this section. For now, just keep going. Then came the blowouts. A tense 17-15 win in Gainesville was followed up by the aforementioned 42-13 drubbing in Tallahassee, and just to rub it in one last time, the 49-0 disembowelment of the Seminoles in 1973. Here’s the thing: Florida really wasn’t good. The Gators finished 5-5-1 in 1972, when they won 42-13, and 7-5 in 1973, when they won… what was it again… oh right, 49-0. UF was a mediocre program at best, but they were still better than FSU, who went 0-11 in 1973. That’s right. 0-11. Let’s hear some more of those 4-8 jokes, Nole fans. The back to back whoopings were followed up by an unspectacular 24-14 win in Tallahassee, yet another beatdown in Gainesville by a score of 34-8 and then came the 1976 game. This was Bobby Bowden’s introduction to the rivalry, and it went pretty much like his farewell to the rivalry; Florida won. Unfortunately for Gator fans, Bowden would soon get winning figured out. By the way: FSU’s rushing total in the 1969 game was -18 yards. That’s right. Minus 18 yards. It only took Bowden two years to do something FSU had never done: a double digit win season. This was in 1977, when FSU waltzed into Gainesville and took the Gators apart, 37-9. It wasn’t just the first time FSU had beaten Florida by 28 points; it was the first time FSU had scored 28 points in the rivalry. The Seminoles rode that win to a 10-2 record and a Tangerine Bowl (now the Citrus Bowl) appearance against Texas Tech, who they clobbered 40-17. And for the first time ever, FSU finished a season ranked in the Top 25, checking in at #14. FSU declined slightly the next year, but that didn’t stop them from picking up their second win in a row over Florida, a 38-21 victory in Tallahassee. 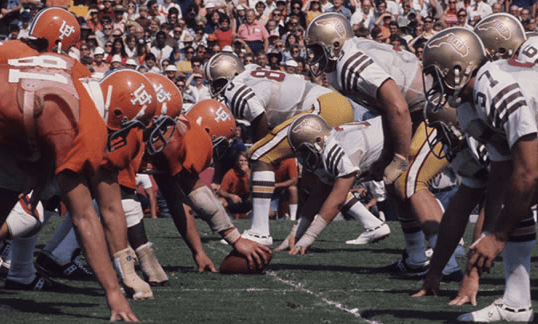 The Seminoles then regained their momentum and reached consecutive Orange Bowls in 1979 and 1980 (losing each time), beating Florida twice more along the way. The 1980 game really hurt. Still sniffing a big bowl game after a tough loss to Miami, Florida went up 13-3 on FSU early and held that lead until the third quarter. But FSU QB Rick Stockstill hit Hardis Johnson for a pair of 20 yard touchdown passes to steal a 17-13 win. However, it’s also noteworthy to point out just how bad Florida was at this time. 1977-1980 was arguably the worst four year stretch in Gator football history. Florida went 18-25-2 in that time span. For perspective, Florida had not been that bad over four years since the 1940’s. And the four year Will Muschamp debacle, during which Florida went 28-21, is the third worst four year stretch in Gator history. But no matter. It’s about to get fun again. I always find it so funny when FSU fans try to claim that Bobby Bowden owned Florida before what they call the demise of Bowden in 2004 (right, like winning the ACC and making the Orange Bowl in 2005 is such an indication of a coach’s demise. Stop it.) Not only did the Gators beat FSU six straight times in the 2000’s, they also did it in this forgotten period called the 1980’s. After losing his first two games against FSU (and going 0-10-1 in his first year), Gator coach Charlie Pell pushed the pendulum back the Gators’ way. First came a 35-3 beatdown in 1981 in Gainesville, which leapfrogged the Gators into the Peach Bowl over FSU. That cost the Seminoles what would have been just the second three year bowl streak in program history. The Gators stole the 1982 game, 13-10 in Tallahassee, and then came more bludgeonings. Anybody ever hear of a guy named Mike Shanahan? Yeah, him. He was the Gators’ offensive coordinator in 1983 under Charlie Pell, and he engineered the single greatest offensive performance by any team in the Florida-FSU rivalry. To their credit, the Seminoles did hold firm for awhile (10-6 in the second quarter), but just like the 2014 FSU team eventually got tired against Oregon, the 1983 team eventually got tired in the Swamp. Shanahan mercilessly exploited FSU’s weak defense by running Neal Anderson left, right, up, down, and all over the field, and when FSU tried to load the box to stop him, he punished the Noles by throwing over the top with Wayne Peace. When it was all said and done, Florida had amassed well over 500 yards and set a record for most points scored in the Florida-FSU rivalry (53) that still stands to this day. Because I like quoting scores, it was 53-14. After a ho-hum 27-17 win in Tallahassee the ensuing year, it was back to Gainesville in 1985 for yet another Gator rout. This time, it was “only” 38-14. FSU actually came into this game ranked #12, but the Seminoles were once again no match for Galen Hall’s Gator squad, who raced out to a 28-0 halftime lead and cruised from there. And then came the 1986 game, the last of the six straight Florida wins. The phrase “Bell to Nattiel” is primarily used to describe the famous 97 yard touchdown pass from Kerwin Bell to Ricky Nattiel in the 1984 Florida-Georgia game, but in reality, it’s just as applicable to describe the 1986 Florida-FSU game. The Seminoles clung to a 13-10 lead late in the fourth quarter on a rainy evening in Tallahassee, and were driving to put the game out of reach. The Gator defense stiffened, and forced a field goal attempt- which was blocked. Bell then led the Gators down the field, capping the drive with a 20 yard touchdown pass to Nattiel with 1:39 to go, who emerged from the turf looking kind of like Valdez Showers did when he got tackled on the opening kickoff of the 2014 Florida-Idaho game. Florida’s defense then held on downs and preserved the 17-13 win, Gator fans throughout the stands mocked FSU with a War Chant and Tomahawk Chop, and everybody in orange and blue was happy. So it would stay that way forever, right? It would be morally and journalistically wrong of me to just forget about/ignore the times FSU dominated Florida and not write about them, so let’s just do this and get it over with. After suffering six consecutive losses to the Gators, Bowden suddenly remembered how to beat them, and launched a four game winning streak in the series. The worst of them was a 52-17 shellacking in Tallahassee in 1988, and it was no coincidence that the Seminoles became a national power during this time; during the four year streak, FSU would win two Fiesta Bowls, a Sugar Bowl and a Blockbuster Bowl (now the Russell Athletic Bowl). Meanwhile, NCAA sanctions chased Galen Hall out of Gainesville in 1989, and he was replaced by Steve Spurrier, who engineered a miraculous turnaround in his first season in 1990. But one of the two blemishes on the 1990 team’s 10-2 record was an ugly 45-30 loss to FSU, in which Florida was only out gained by three yards but committed three turnovers and gave up 147 yards rushing to FSU tailback Amp Lee. The 1991 game was the only one in this stretch that’s any fun for Gator fans, but it was quite an important one. FSU started the year ranked #1, and held that top spot for most of the season. But in the Seminoles’ second to last game of the year, they were upset by Miami in the first of many “Wide Right” losses to the Hurricanes. So the Seminoles were down, but not out of the national title hunt, sporting a #3 ranking heading into the showdown with Florida. But the 5th ranked Gators crushed FSU’s dreams of a national title with a 14-9 upset courtesy of Shane Matthews’ 73 bomb to Harrison Houston. FSU went back to its winning ways in the series with a 45-24 win in Tallahassee in 1992, and continued them in the 1993 game in the Swamp, one that really stings for Gator fans. FSU was up 27-7 after three quarters, but the Gators rallied for two straight touchdowns to cut the margin to six midway through the fourth quarter. Now it was up to the Gator defense to get one more stop. But Charlie Ward hit Warrick Dunn in the flat, who ran 79 yards for the game clinching touchdown. FSU would go on to win their first national title the ensuing January. But that 1993 loss as nothing compared to what happened in 1994. It’s true, Florida didn’t lose the game, but that’s the only reason the 1994 Florida-FSU game is not known as the single most devastating collapse in college football history (the 2006 Insight Bowl holds that distinction). Despite the fact that I was just eight months old at the time and thus don’t remember it, this remains the most horrifying performance by any of my favorite teams in my lifetime. If you’re even a casual fan of either team, you know the story: Florida was up 31-3 in the fourth quarter, and Danny Kanell led the Seminoles all the way back to force a 31-31 tie. Because there was no overtime in college football back then, the teams were forced to settle the matter in that year’s Sugar Bowl- which FSU won 23-17 thanks to a reverse touchdown pass from Dunn to Omar Ellison. Enough of that. There’s more good stuff ahead. Let’s get to it. It’s true that Steve Spurrier was mostly unsuccessful against FSU in his Gator coaching career. I say mostly, and not totally, because of this little three year stretch- one that, upon mere mention, still holds the power to make FSU fans spontaneously combust. First came the 1995 game. #6 FSU, #3 Florida, in the Swamp. National championship dreams on the line for both teams (albeit FSU’s were much smaller than Florida’s). Scott Bentley kicked an early field goal to spot FSU a 3-0 lead, but then the Gators unleashed three years and four games worth of frustration on FSU, exploding for 28 points in a 20-minute span that knocked the Seminoles down for the count. Down 28-6 in the third quarter, FSU tried to rally. Dunn punched his way in to cut the lead to 28-14 with the ensuing two point conversion. But Danny Wuerffel landed the knockout punch with a 74-yard strike to Ike Hilliard on the very next play. The Gators, who ended up with a whopping 537 yards on the day (443 through the air from Wuerffel), did allow FSU to score the final 10 points, but unlike the year before, their defense slammed the door shut before it got too close by picking off Kanell on his last two possessions to secure a 35-24 win, relieving Florida fans of the worry that Spurrier would never again beat his Thanksgiving weekend rival. Then there was the 1996 game in Tallahassee. Um, yeah, about that. This was a #1 vs. #2 game, meaning the hype preceding the 1995 game paled in comparison to this one. But the top ranked Gators struggled early; Danny Wuerffel threw three interceptions and Peter Boulware blocked a Florida punt. The Noles exchanged those presents for a 17-0 lead. Wuerffel tried to lead Florida back, cutting the lead down to 24-21 with three touchdown passes. But the onside kick following the third one went out of bounds and FSU survived. Also worth pointing out about this game is that Steve Spurrier accused FSU of hitting Wuerffel late; Bowden even admitted his players were taught to hit “until the echo of the whistle”. Hm, OK. We’ll remember that. Then there was the 1997 Sugar Bowl in New Orleans. Um, yeah, about that. This was a rematch of Florida and FSU for the national title, meaning the 24-21 FSU win five weeks earlier meant nothing. This was it. The national championship game, thanks to Ohio State upsetting Arizona State in the Rose Bowl. Credit where due: FSU hung around for a little while. It was 24-20 midway through the third quarter. And then the Gators must have decided that they were simply tired of losing to Florida State, and ready to win a national title. FSU probably can’t remember what happened next. It’s just as well. Danny Wuerffel and Co. matched FSU’s 28 straight two years earlier with 28 straight of their own. The difference was, this time, Florida was already winning when the barrage started. By the time the toothless Tribe finally staggered into the locker room… get ready for this… they had surrendered the most points in Sugar Bowl history- a mark that still stands and has only been challenged once … by Florida, in 2009- and suffered their most lopsided bowl loss in school history, a distinction that held until Oregon clobbered them 59-20 in the Rose Bowl on New Year’s Day of 2015. And just because I love quoting scores… this one was 52-20. Most of you reading this probably already know that, but I just felt like throwing the score in there for the hell of it (and because FSU fans like to remind Gator fans that they won the original meeting, and thus they shouldn’t have had to play again, or some such nonsense). So that’s going to be pretty tough to beat in terms of pure awesomeness, right? Well, the 1997 game didn’t quite top it, but it may have matched it. FSU came into the game ranked #1 in the country, undefeated and sniffing a national title. Florida, for its part, was by all intents and purposes eliminated from national championship contention. But that didn’t mean the Gators couldn’t spoil FSU’s fun. A back and forth game found FSU leading 26-25 with under three minutes left. Sebastian Janikowski kicked an insurance field goal with two and a half minutes left to make it 29-25, and then did the stupidest thing I’ve ever seen late in a football game. He did the Gator Chomp. Straight down the field went Florida following the Gator Chomp, 80 yards in three plays. A bomb from Doug Johnson to Jacquez Green picked up 62 and put the ball at the FSU 18. Fred Taylor then picked up 17 more on a draw play to put the ball on the shadow of the goal line. And then Taylor finished it off himself with a one yard touchdown run to put Florida up with under two minutes to go. FSU had one more chance, but Dwayne Thomas picked off Thad Busby to seal the deal. 32-29. Final. Upset complete. National title hopes destroyed. But sadly, that was about the end of Spurrier’s fun. We’re taught that quality, and not quantity is what’s most important. The quality of the three Florida wins from 1995-97 best the quantity of losses Steve Spurrier suffered to FSU. Nevertheless, those losses happened, and the back end of them fall into this next time period. Before the 1998 game, a fight broke out between Gator safety Tony George and several FSU walk-ons, all of whom were ejected. Not a good trade off for Florida. That spawned a full scale brawl at midfield between the two teams, during which Doug Johnson fired a ball at Bobby Bowden. Johnson later apologized and said he had no target for the ball, he just hucked it randomly. The fact that FSU won the game 23-12 is a mere side note to the pre-game fight. Johnson’s 50 yard bomb to Travis McGriff to start the game was about the only thing that went well for Florida all day, which managed a meager 204 yards of total offense in the defeat. The Gators appeared to be in great shape in the 1999 game when Bennie Alexander picked off Chris Weinke and took it 43 yards to the house to make it 16-13 midway in the third … and then they totally collapsed as FSU ran off 17 unanswered to take an insurmountable 30-16 lead. After the #1 ranked Seminoles won 30-23, they headed to the Gator F at midfield for a post game dance, which sparked another fight, albeit a brief one. The Seminoles would ride that win to their second national title, and then ran their streak to three with a 30-7 romp over the Gators in 2000. In a bit of role reversal, Florida was the heavy favorite in 2001, which turned out to be Steve Spurrier’s farewell to the rivalry. The Gators dominated the game, running out to a 34-13 lead late in the fourth quarter, but that wasn’t good enough for the Head Ball Coach. Of course, being Spurrier, he rubbed it in with a totally unnecessary field goal in one of the few moments he was actually in a position to do so (or maybe he still remembered the 1994 game), making the final 37-13. Then Spurrier left, Ron Zook arrived, and things got bad again for Florida. A 31-14 FSU win in 2002 welcomed the ill-fated Zooker to the rivalry, and the 2003 game marked the beginning of the end of his Gator tenure. Trailing 31-27 with 2:59 to go, freshman QB Chris Leak hit Ben Troupe in the back of the end zone for a 26 yard touchdown to put Florida up 34-31. All the Gators had to do was get one more stop- and it looked like they would as they pushed FSU backward to force a 4th and 14. But FSU QB Chris Rix hit Dominic Robinson down the middle of the field for a first down, and on the very next play, heaved a bomb that PK Sam grabbed in the end zone as he was falling down. FSU 38, Florida 34, final. But oh, that wasn’t enough. FSU players then stormed the field and started jumping up and down on the midfield F again, only this time it triggered a legitimate bench clearing brawl. Helmets came off, punches were thrown, and FSU brought out the Gator head and paraded around with it like it was the key to eternal life. Let this be a lesson for future FSU players: let sleeping dogs lie. Isn’t it just so much more fun to read about how Florida clobbers FSU for six years at a time? Well, good! Because this section is more of that. No matter how well you plan things, they just don’t always go the way you anticipated. FSU learned this lesson in a rather heartbreaking fashion in 2004, when a 6-4 Florida team limped into Doak Campbell Stadium and claimed Bobby Bowden night for themselves. Just like they’d done in 1997, Florida totally spoiled what was supposed to be a special night for the Seminoles, ruining not only the moment of renaming of their turf to Bobby Bowden Field, but costing them a BCS Bowl berth as well. What made this game so amazing was that FSU never led, and never even had it tied after Florida scored first. Chris Leak established from the get-go that this would be Florida’s night, and even though the defense once again got burned by Chris Rix, they stood tall when they were needed the most. Jarvis Herring picked off Rix with 10 seconds to go and the party was on, complete with Tomahawk Chops, midfield dancing (how do you like it?) and Zook’s victory ride around Doak Campbell Stadium to punctuate the 20-13 win. Then the drubbings resumed. 2005 marked Urban Meyer’s arrival in Gainesville, and he welcomed himself to the rivalry by destroying FSU 34-7 in Gainesville. Florida was actually out gained by 50 yards, but four FSU turnovers removed any possibility of the Seminoles winning the game. The 21-14 win in Tallahassee the ensuing year was nice- ugly as it was, it was a win- but the three games from 2007-2009 were exponentially more enjoyable. The Gators sledgehammered the Seminoles by scores of 45-12 in 2007, 45-15 in 2008 and 37-10 in 2009; insert your FSU fans can’t do math joke here, but that’s a composite score of 127-37 over those three years. FSU was nothing more than Tim Tebow’s punching bag, surrendering 14 touchdowns, nearly 1,000 yards and seemingly half of the garnet paint in their end zone to the Gators’ Mr. Everything. Along the way, Florida won a pair of national championships in 2006 and 2008, making life even more fun. And while we’re on the subject, the 2005 and 2009 games weren’t as close as those scores suggest. In each game, FSU scored a touchdown against Florida’s backups when the outcome of the game was no longer in doubt. This is what I meant back in the “Huff the Magic Quarterback” game. FSU is great at scoring touchdowns when nobody cares if they score touchdowns and/or when scoring touchdowns are wholly irrelevant in the grand scheme of things and have no chance of impacting the game’s outcome. But consolation touchdowns were all they had against Florida during this time frame. Unfortunately, that hasn’t held true since. 2010 began another pro FSU cycle. Florida led 7-3 early, but an avalanche of mistakes came back to bite them in a 31-7 loss. You can repeat that second part for the 2011 game. FSU gained a grand total of 95 yards of offense, but that didn’t matter because Seminole defensive backs gained more than that on interception returns in what may have been the single ugliest Florida-FSU game of all time, a 21-7 FSU victory. I hope reading this extensive historical analysis has been fun, because the last five games were anything but. There have been beatdowns of 27-2, 37-7, 31-13 and 38-22 from FSU in the last half decade to help re-establish dominance in a time period in which the Seminoles were consistently elite and the Gators ranged from mediocre to downright garbage. But the real lowpoint- the game that best describes the current state of the rivalry was 2014, a game in which everything that could have gone wrong for FSU went wrong- and yet they won anyway. A returning Heisman Trophy winner and meta-Tim Tebow named Jameis Winston threw four picks in that game. FOUR. Unfortunately, Will Muschamp’s team’s mastery of self destruction proved greater than Winston’s, as all they could do with those goodies was kick field goals. Well, except for that one play that Tevin “Clank” Westbrook turned into a touchdown by deflecting it right into the hands of Terrance Smith, who ran it all… the… way… 96 yards… for a touchdown immediately following Winston’s third interception, one thrown from his own end zone. That unbelievable failure to take advantage of a golden opportunity, as well as Brian Poole’s ill-fated interior cut on an interception return proved costly in a 24-19 FSU win. Florida and FSU will meet at a crossroads in 2018. Both teams sport new head coaches and had high hopes for instant success. One of them has mostly delivered on that front, while the other has absolutely not to up to this point. The team coached by the former is in search of its first ever New Year’s Six Bowl appearance, while the team coached by the latter is in search of… a bowl, any bowl, with failure in that search promising to result in the end of a 36 year streak in which they have succeeded in this search. Whichever team wins on Saturday will succeed in its quest, while the loser will not. And for a rivalry of this stature, being able to stop your rival from your achieving its goals is every bit as sweet as achieve your own goals. So for one of these two teams, this Thanksgiving will be doubly sweet. Intimidatingly long but worth the read. Fantastic job, man. Great job as usual, Neil.